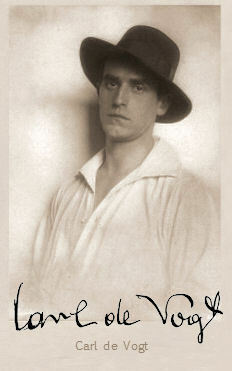 The actor Carl de Vogt attended the acting school in Cologne and thereafter he began a successful career at the theater. His earliest ascertainable movie is "Schwert und Herd" (16). In the following years he became established as a screen star in adventurous roles, especially in the early works of Fritz Lang he attained lasting fame. To these movies belong "Halbblut" (19), "Der Herr der Liebe" (19) and "Die Spinnen", where he played a character which reminded one of the later Indiana Jones. Carl de Vogt got married with the actress Claire Lotto and played with her in several movies in the next years. Because of his successful parts he became one of the greatestGerman movie stars at the beginning of the 20's with movies like "Die Todeskarawane" (20), "Die Schatzkammer im See" (21), "Der Herr der Bestien" (21), "Die Tigerin" (22) and "Helena" (24). Together with the acting he was also active as a singer and recorded several discs. His greatest hit was "Der Fremdenlegionär". Carl de Vogt appeared in successful productions till to the 30's but the talkies offered him merely small and smallest parts. The glory of Carl de Vogt faded quick. Although he was once a celebrated star, his name fall into oblivion soon. Only some guest appearances in movies like "Briefträger Müller" (53), "Die Ratten" (55), "Die unsichtbaren Krallen des Dr. Mabuse" (62) and "Der Würger von Schloss Blackmoore" (63) let turn up his name on the cast list once more.